Relay Racks are the least expensive of the server racks. Relay racks only have two uprights to support the equipment instead of the four uprights that other rackmount cabinets have. 90% of all relay racks are made from aluminum extrusions and have threaded holes. Relay racks are most commonly used in data closets and back offices where only one or two racks are needed. The are also used in huge data centers with 1000″s of racks when space is a premium and cooling is critical. Most network and telephony equipment is designed to be installed in a relay racks without additional rails or brackets. Servers and electronics can be installed in a center mount or a flush mount configuration in the relay racks. The installation of servers, however, will require the purchase of special rackmount installation kits or conversion kits for center mounting or flush mounting. 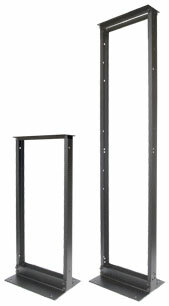 Relay Racks must be bolted down to the floor or have some type of structural support to a wall, ceiling, or cable tray. The cost of the structural support and additional conversion kits should be considered when purchasing relay racks. The added cost can make the use of relay racks more expensive than using a fully enclosed rackmount cabinet. Relay racks provide optimal ventilation due to unrestricted airflow too and from the servers and electronics. The access to the equipment and cabling is easy using relay racks. When purchasing relay racks an important feature to look for is the manufacturing process. The higher quality relay racks are made using an extrusion process. This means that the aluminum upright is formed and not bent into shape. This entry was posted on Thursday, October 11th, 2007 at 12:20 pm	and is filed under 2 Post Racks, Racks. You can follow any responses to this entry through the RSS 2.0 feed. You can leave a response, or trackback from your own site.